Paul Procter writes……It’s that time of year again, when our tackle gets dusted down in preparation for the season’s first outing. Fly lines are cleaned, reels oiled and along with new patterns to try, rods will be at the ready. Personally speaking, it seems barley a few years ago when the opening weeks were something of a damp squib. Then cold, miserable weather made sure trout kept their heads down and any attempt at fishing dry fly was deemed foolhardy. I even wrote somewhere that the dry fly tactics are off limits during March…how wrong can you be? Times have changed and my diary shows that for the past four seasons fish have regularly taken flies close to or on the water surface. Experts tell us global warming is to blame, yet I’m not so sure whether our winters are actually getting any milder or just becoming more unsettled? Perhaps a better term would be “climate change”? Whatever your views here there’s no denying things are definitely afoot. As a youngster I remember any cold snap would last for weeks at a time. These days, we’re subjected to a few days of rain, followed by a chilly blast and by the time you’ve found those winter woollies, its back to the wet stuff. What nature and more importantly the trout think of this, who knows? Though given settled weather leading up to opening day, fly hatches generally respond in our favour these days. Whilst the best of the hatches are reserved for May, never look a gift horse in the mouth. Nowadays, it only takes one rise for me to swap nymphs for surface flies, well, maybe two, but no more! On some days trout can be up and gone in minutes, at other times you may have their company for a good hour and more. So failing to act on these vital signals can prove costly. As ever, in anticipation, I arrive at the river far too early. If you have the inclination an hour or two scratching about using weighted nymphs usually produces the odd fish. Call me a purist, however, for me there’s something special about tempting the first fish of a new season on dry fly or spider tactics. The best of any activity will inevitably take place between lunchtime and 3pm though may extend towards dusk on milder days. Whilst I’m a slave to complex leaders which contain several sections of mono and as many knots, the early season set-up is best kept simple. For spider fishing, a five foot tapered leader attached to the fly line acts as the delivering force. Three flies positioned about 30 inches apart on 3lb breaking strain is about right, giving an overall leader of 12ft or so in length. If the need arises for a quick change to dry fly, it’s only a matter of replacing the spider rig with 4ft length of 5lb copolymer before knotting on a 3.5lb tippet of equal length. This tippet section may appear long by text book standards. However, it tends to land in loose coils, allowing your fly a degree of freedom. With two spiders carefully secured to dropper legs and a small nymph on the point, fast, streamy water will be our first port of call. Here, added weight from the nymph helps “dig in” your flies. Yet, a move to slower glides may see the nymph replaced by a third spider pattern. 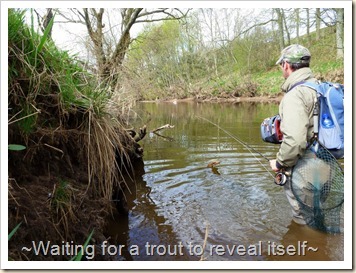 A huge dilemma facing the wet fly enthusiast is whether to fish upstream or downstream? Fish often show a preference for a given approach on certain days and no two days are alike. 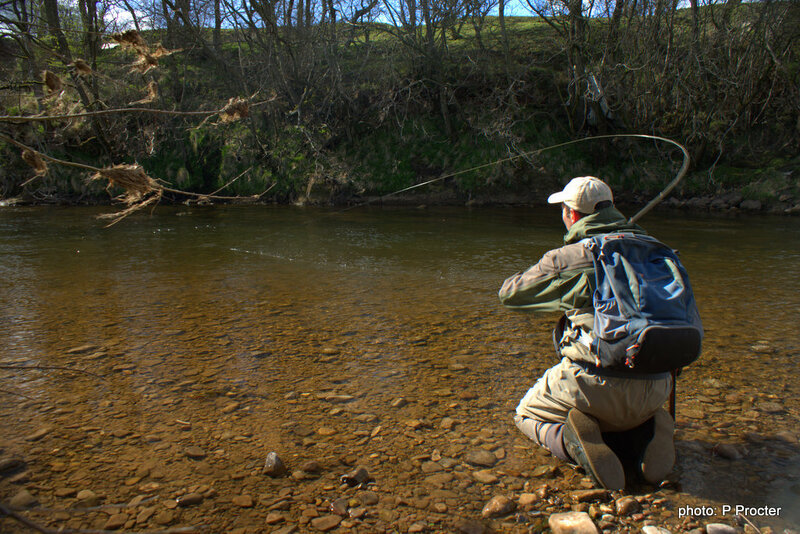 It might be the upstream method that works its magic one afternoon then the very next outing involves fishing downstream to connect with trout. Various water characteristics will also influence your choice. In narrow, riffling runs with easy wading, quartering upstream is often productive. Now, search the water by fan casting. Keep a short working line, no more than three rod lengths. This not only makes for effective fly and line control, takes are more likely to be spotted. A short belly section of an old Hi-Viz fly line connected between line and leader marked with a black waterproof pen helps detect the subtlest of takes. Heavy, fast water would mean some full-on casting and retrieving with barely time to draw breath. Life is made easier here by dead-drifting flies across the rushing current. Pitch the flies some 45 degrees across and upstream of square, followed with an upstream mend. This enables the flies to sink. Now, track the line’s progress downstream with an elevated rod tip. Takes generally register as the fly line hesitating or drawing away. It’s then just a case of tightening into fish. If no takes are forthcoming there are two options available. Either, lift off and represent upstream, or allow the flies to drift unfettered until a tensioning line accelerates them across the flow. The across and downstream method is often dubbed a “chuck and chance it” affair. Apart from being deadly in the right hands, it’s a great way to make a blanket sweep of pools in the absence of rising trout. Furthermore, water that remains untouched to the above methods can be fished with confidence. And, by adding an upstream mend, natural drifts are achieved before a taught line causes the flies to swing round. 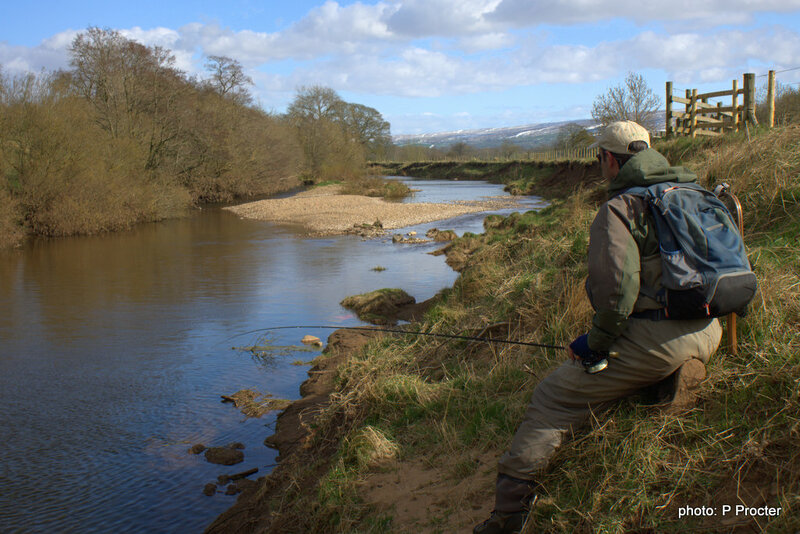 As the flies wash downstream move the rod tip at the same pace, watching the line for pausing or any movement. Further mends can be thrown to eke out a little more drift before grabbing currents finally have their say. 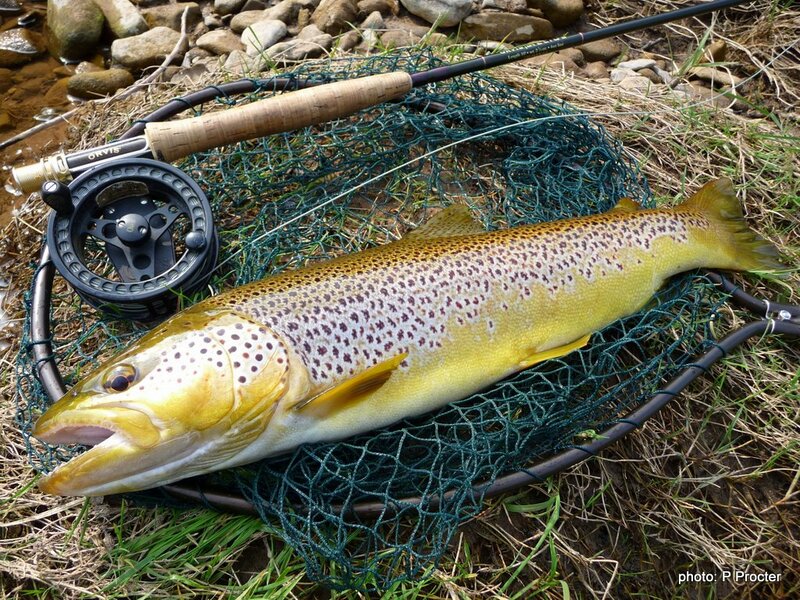 Once a hatch of fly is under way and fish are looking up in earnest, it’s worth popping a dry fly on the point. This dry/spider team offers the best of both worlds. Fish seeking surface duns will home in on the dry and those harvesting emergers or drowned adults can’t resist a spider. Of course, it’s critical that drag does not affect the drift now. Although trout may on occasion tolerate this in sub-surface flies, more fish will be put down than caught by a dry fly skating past their noses. Despite the dropping temperatures of late afternoon, fish frequently continue feeding until dark. 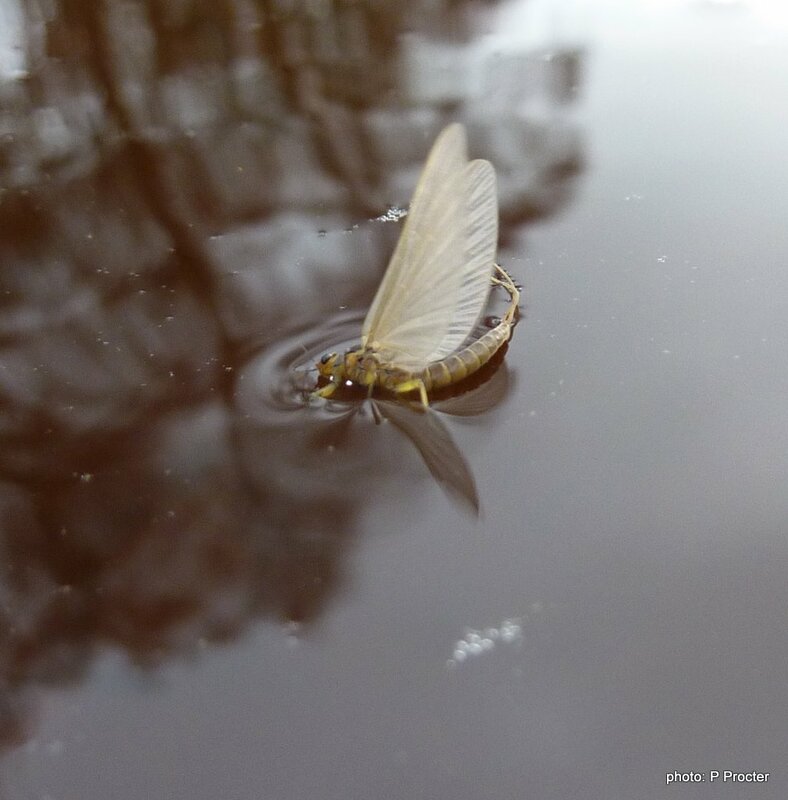 Even when Large Dark Olives or March Browns have long gone there’ll always be a few stragglers and a residue of stillborn upwinged flies washing downstream. Midges too may keep trout on the go. For the last hour I will alter my team of flies once more. A size 20 black spider will occupy the top dropper. Below this sits a size 18 black magic and on the point, a size 16 waterhen bloa. Even at this time of year, fish grow confident in the gather gloom and more than once blistering sport has been reserved until daylight dwindles. 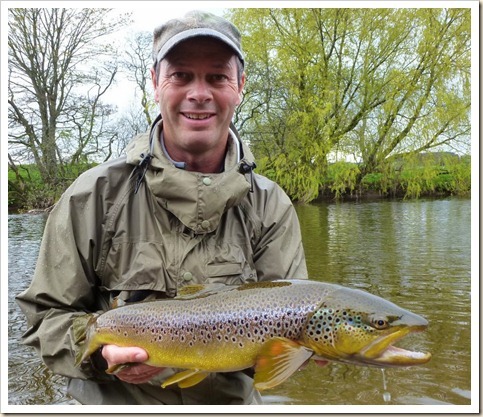 Paul Procter is best known for his prolific writing in the UK’s leading publications,Trout & Salmon and Trout Fisherman, Paul is a qualified AAPGAI instructor at Masters level and is regarded by many to be in the forefront of UK fly fishers.